It is now communicated that Judge Riddle ruled Julian Assange should be extradited to Sweden. The main newspaper Svenska dagbladet (SvD) informs on the arguments against Assange's defence "But Riddle says also that there is a significant negative publicity about Assange in Sweden", affirms SvD, which is en the line of what I have also argued - based on empirical research - in my report intended to be filed by Assange's lawers to the Court (Exhibit MF-N1) and thus sustaining the allegations on a Swedish Trial by the Media previously manifested by such lawyers. 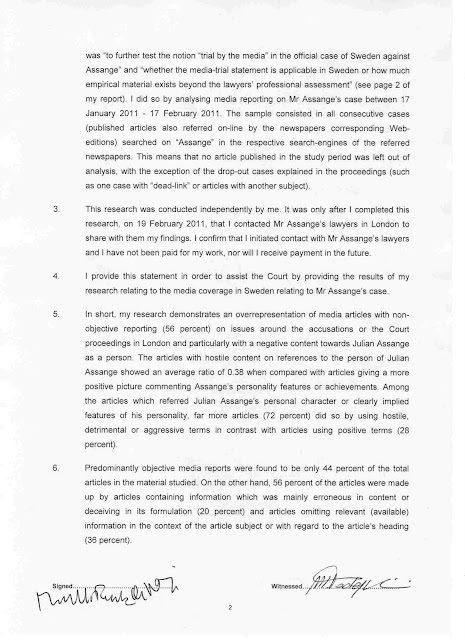 My witness statement would not be referred to "in open court", because the judge did not consider the additional material submitted by the lawyers 22 February on the formal ground it was such close date to the verdict (24 February). However, Judge Riddle did not completely disregard my report giving a panorama on the unfair media hostility against Assange. Otherwise is not comprehensible that Judge Riddle referred particularly to this issue in his "Summary of the facts found". "There has been considerable adverse publicity in Sweden for Mr Assange, in the popular press,"
"a significant over-representation of negative assessments" about Assange in Swedish media articles. 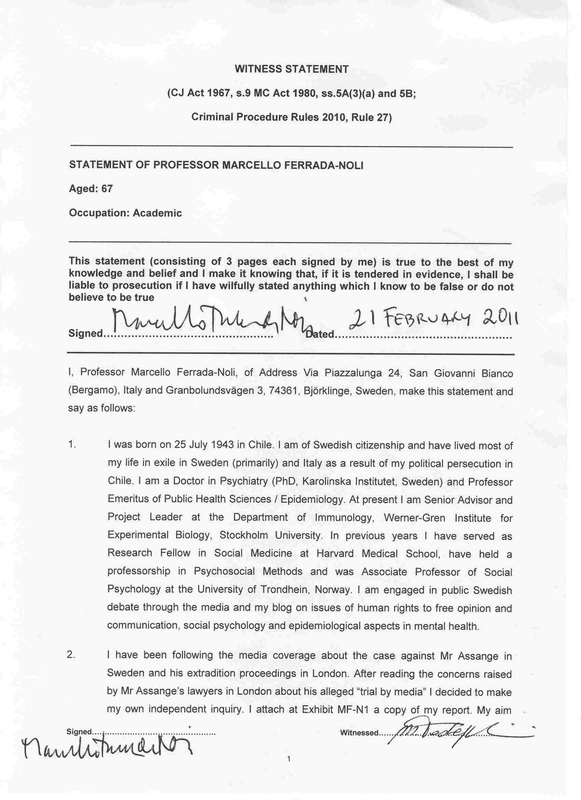 The independent inquiry I have conducted with the aim of testing whether the “Trial by Media” described by Julian Assange’s lawyers would have an empirical base in Sweden – and which I mentioned in a variety of publications [such as here (Summary), here (the censorship comment) and here (the full report)] – occasioned a manifested positive response from readers. I had also received several suggestions about forwarding the results of this research to the team of lawyers defending Assange upon the London Courts. After carefully considering this proposition, I took finally the initiative of contacting Julian Assange's lawyers in London and, on behalf of his legal defence I signed the Witness Statement attached here below. 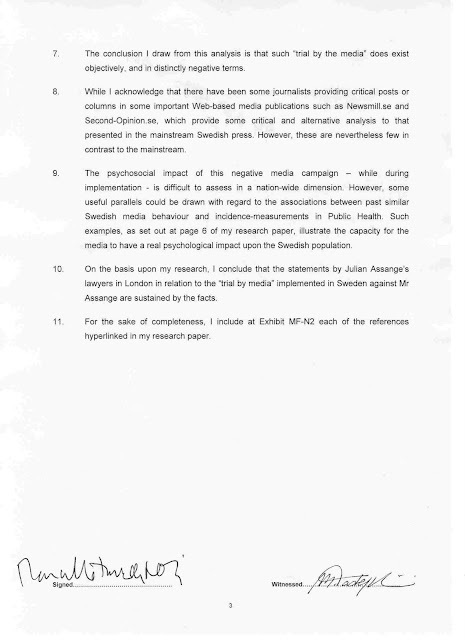 I provided my statement in order to assist the Court by making available the results of my investigation regarding the media coverage in Sweden reporting the case of Julian Assange. According to what I was informed from London the lawyers had given my statement to the Court the 22 February . I fully stand for my report. Although it was primarily published as an analysis for information purposes and in view of my readers in general – and thus not originally edited in the form of a scientific report – the proceedings, statistical analysis and results that the statement refers are nevertheless fully methodological consistent. In fact, it has been a unique professional occasion in which I was able to use both my research experience in social psychology and psychiatry, but also epidemiology, when assessing the possible large-scale impact of media campaigns. 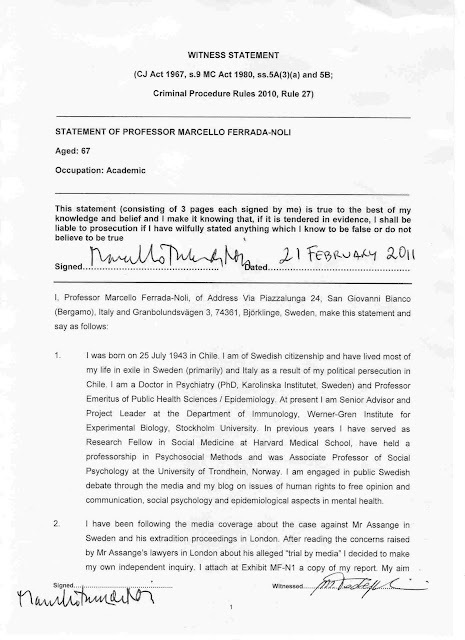 I was also able to apply in this particular case some ethical parameters related to for instance individual integrity, a theme constantly scrutinized in the sessions of the Swedish Ethical Board for Research, Uppsala Region, which I have had the opportunity to attend since 2007 to present. I also wish to let my readers know that the intervention from my part has been absolutely not remunerated, and that I have declared by own decision that neither I will accept any payment in the future on this matter. I have also declared I have done this on my own initiative, being the responsibility entirely mine. And I am proud of it, to have been able to help a cause I esteem as noble, and against a process which I regard as unjust, biased, and clearly against the human-rights I advocate. I am not alone. For each journalist assigned to uniformly repeat the official version there are thousand bloggers, more or lesser known, however equally important. There are as well other Swedish journalists and authors -perhaps not as many as I would wish - engaged in this case and that with their civil courage and professionalism help the truth to prevail. As well as all over the world. Among these, I wish to thank especially, warm and genuinely, Andrew Kreig and Naomi Wolf, the prominent authors and defenders of human-rights, guest-columnists in Professors blogg, which have contributed with their theses on behalf of our readers from Sweden and abroad. They have answered with over ten thousand visits in just a couple of days, indicating the interest this case maintains among the cultivated, but also the need of supplying the public with an alternative version than the official media mainstream. From my side, as for many other libertarian comrades-in-arms, this is just another day at the work. For what I have done my entirely life is to put all my research work at the service of the cause of exposing the abuse of the oppressor against the humble, of the rich against the poor, of the powerful against the miserable. For, as you also have fully understood, the WikiLeaks project represent a world-wide weapon of intellectual nature, capable to move the mountains from where the power has abused so many, so long, and so dramatically. Here is some more #prataomdet and "trial by media". It is written by one of the main figures in the #pratomdet (#talkaboutit) campaign. Pls also read the comments, the ones left, that is!